October 2012 – Honorable Mention in drawing category for A Little Birdie Told Me. Highland Art Center, 28th Annual Juried Art Exhibit, Juror: Jon Cummins, artist and Executive Director, Chico Art Center, Chico, CA. Contemporary Woman 6, a national juried exhibit, Chico Art Center, Chico, CA. Juror: JoAnne Northrup, Nevada Museum of Art, Director of Contemporary Art Initiatives. October 2011 – 1st Place in oil/acrylic painting category for Meal With Honey Bees, Meal Without Honey Bees; 2nd Place in oil/acrylic painting category for The Day Space Junk Landed In the Yard – Highland Art Center, Weaverville, CA, 27th Annual Juried Art Exhibit, Juror: professional visual artist, Christine Hayman. 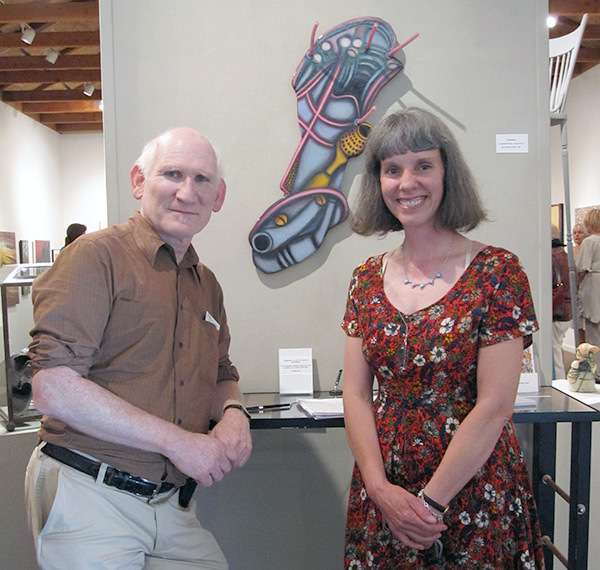 July 2011 – 1st Place for mixed media painting, Amphibioso – Chico Art Center, Chico, CA, National Juried All Media 2011; Juror: Peter Frank, Los Angeles area curator and art critic for ArtNews, Angeleno Magazine, and the Huffington Post. October 2008 – 2nd Place in painting category for Car Jacking; 3rd Place in sculpture category for Forest’s Future/Future’s Forest – Highland Art Center, Weaverville, CA, 24th Annual Juried Art Exhibit, Juror: Jack Bentley, Director, Humboldt State University, First Street Gallery, Eureka, CA. October 2007 – 1st Place in painting category for Ghost; 1st Place in sculpture category for Coyote; 1st Place in mixed media category for Fallen Angels No. 3; 2nd Place in water media for Genie Bottle; Honorable Mention in painting category for Tire Recycling Concept No. 1; and Honorable Mention in drawing category for Spare Parts; 8 of 12 pieces selected by juror – Highland Art Center, Weaverville, CA, 23rd Annual Juried Exhibit, Juror: Lindsay Coates, Curator, Morris Graves Museum of Art, Eureka, CA. October 2006 – Honorable Mention for painting Candy Land – Highland Art Center, Weaverville, CA, 22nd Annual Juried Art Exhibit, Juror: Luke Lucas, Director, Mount Lassen Art Center, Chester, CA. May 2006 – Best of Show Award for painting Dumpster Diving; Firecracker Award from Shasta College Art Department faculty Shasta College, Redding, CA, 56th Annual Juried Student Show, Josine Ianco Starrels of Schneider Museum of Art, Ashland, OR. October 2005 – 2nd Place for painting Launch– Highland Art Center, Weaverville, CA, 21st Annual Juried Art Exhibit, Juror: professional visual artist, Anne Kincaide.